Arsene Wenger has criticised the French Football Federation for picking Abou Diaby for October's World Cup qualifiers against Finland and Belarus. The Arsenal midfielder is set to miss the next three weeks after picking up a thigh strain in the early stages of Saturday's 2-1 defeat by Chelsea. Diaby, 26, has struggled with injuries but started the season in good form. "I think it was a mistake to play him with the national team," said Wenger, who asked the FFF not to pick him. The knock will see Diaby miss Wednesday's Champions League clash with Olympiakos after Wenger told his compatriots to give him a rest if they wanted him fit for next month's qualifier against Spain. "I said many times that if France wanted Diaby in Spain they should not take him for Finland and Belarus," he said. "They could have taken him but not played him because the guy has been out for a year, played four or five games. You have a breather, give him two weeks to recover completely." Diaby has started just 87 Premier League games since joining Arsenal in 2006. Diaby's problems began in May 2006 when he was on the receiving end of a tackle from then Sunderland defender Dan Smith that fractured his ankle and required three operations to repair. 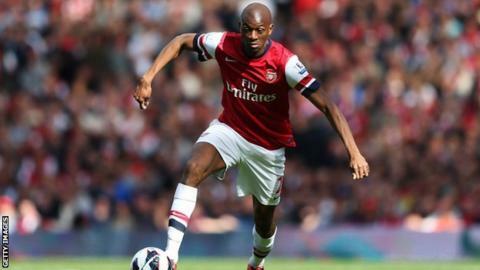 After eight months out, Diaby began to cement his position in the Arsenal midfield before a thigh injury ended his 2007-08 campaign prematurely. But he was a near ever-present two seasons later and started all three games in France's disastrous appearance at the World Cup in 2010. He was only fit enough to play 16 games in the top flight in 2010-11 due to more injuries, and made five substitute appearances in all competitions for Arsenal last season following ongoing issues with his ankle, a condition that forced him to miss France's Euro 2012 campaign. Diaby had started all but one of Arsenal's league games this season before he was injured once more when taking a shot from distance against Chelsea and was replaced by Alex Oxlade-Chamberlain after 17 minutes. While Diaby is set for another period on the treatment table, fellow midfielder Jack Wilshere returned to action on Tuesday in an under-21 fixture after more than a year out with ankle, foot and heel injuries. "He came through it all right," Wenger said. "It is now down to taking the right time to ease him slowly back. "We are all very happy and he especially must be exceptionally happy. He has been out for 14 months."